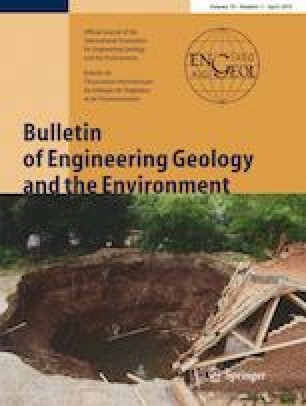 The variability of the geotechnical properties of lateritic gravels developed on metamorphic rocks from the same clay protolith and of a nearby degree of metamorphism was studied for road construction purposes. Chlorite schist-derived lateritic gravels are more quartzose, more plastic (Plasticity Index PI = 27%) and have a weak Californian bearing ratio (CBR = 50%) compared to those developed on mica schists (PI = 18%, CBR = 62%). The principal components analysis results confirmed by those of agglomerative hierarchical clustering reveal the existence of two groups of materials, the lateritic gravels on chlorite schists (skeleton = 48.27%, mortar = 36.31%, fines = 27.63%, PI = 29%, grading modulus (Gm) = 1.88, maximum dry density (MDD) = 2.00 g/cm3, CBR = 44%) and the mica schist-derived lateritic gravels (skeleton = 34.82%, mortar = 25.45%, fines = 17.90%, PI = 18%, Gm = 2.22, MDD = 2.13 g/cm3, CBR = 65%). Chlorite schist-derived lateritic gravels are mainly characterized by granulometric and plasticity parameters, while those developed on mica schists are characterized by physical and compaction parameters. The mica schist-derived lateritic gravels are usable as sub-base layers for any type of traffic and as base course for low volume traffic. On the other hand, those developed on chlorite schists can be used as a sub-base for any type of traffic and require some treatment prior to a possible use as base layers. The higher the degree of metamorphism of the parental rock, the better the geotechnical properties of the lateritic gravels generated. The authors express their gratitude to all the anonymous reviewers who have greatly improved the quality of this manuscript.